The facility is equipped with field proven high throughput Epi Reactors used by some of the world’s leading semiconductor manufacturers. Our Epi tools provide excellent layer quality and unique process characteristics for thick Epi applications. 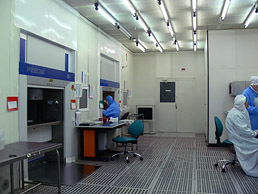 Due to restrictions of clean room environment reactor loading bay and control elements are exposed to the operator, while the machine itself is located behind a wall.